In our teens we all experience or expect some form of acne based purely on pubescent hormones, but the occurrence in adults is something entirely different and needs to be treated as such. The modern lifestyle of stress and environmental pressure are key triggers for adult acne and we at SAI are seeing more and more patients, both men and women, presenting with this condition. Adult acne can have a significant psychological impact on both ones social and professional life and we at SAI consistently upgrade treatment options to solve the acne problem. Depression or lack of self-confidence are closely related to the onset of adult acne, and that is why Dr Clark and his team at SAI keep themselves so up to date with latest acne treatments. Now more and more patients are turning to Botulinum toxin for acne treatment, and in trained hands the treatment is proving successful. Dr Clark can now inject Botox ® directly into the skin to reduce large pores, excess oil production and therefore acne breakouts. Acne occurs when your sebaceous glands produce excessive amounts of sebum (oil) into pores in the skin. This excess oil is the perfect breeding ground for bacteria, which in turn, causes the pores to become inflamed forming pimples. It is believed that the injection of Botox® into the skin blocks chemical receptors responsible for excess sebum production, and similarly temporarily paralyses the tiny muscles in the skin responsible for expanding pores. This treatment protocol for acne is not for everyone, and Dr Clark will need to assess your skin condition and hormone levels before administering Botulinum toxin for adult acne. Dr Clark will also not treat teenagers using this technique. The team at SAI will be able to assist you whatever your acne problem, be it hormonal, stress related or in puberty. 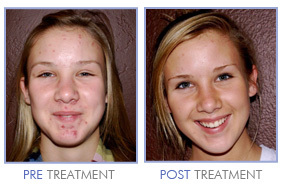 The most important decision you make is to be treated by an expert in the acne arena.